← Where is the bookstore? Being in a book club is popular with many readers. It’s fun to share opinions, likes, and dislikes about a particular selection. 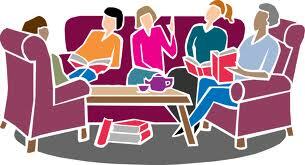 Clubs meet in homes, community clubhouses, book stores, libraries, cafes. They develop their own rules and procedures. Some groups, the products of technology, meet online or listen to regularly scheduled podcasts or radio broadcasts or view TV presentations. Before the internet, book group leaders prepared for the upcoming book discussion by doing research at the local library and in encyclopedias, newspapers, and magazines. They collected author biographical items, reviews, and information about the book itself: characters, themes, setting, plot, structure. They devised questions to ask to stimulate discussion. Gathering information on some authors and books was more difficult than on others. Today, with the internet, the same information on authors and their work is easily found. Discussion questions are also online and often included in the books themselves. (Sometimes these questions are good, sometimes not.) With information so readily available to everyone, how is a discussion kept fresh? More about that in a moment. First, a bit more about book clubs. Discussion leaders (and members) often add hands-on items and visuals of interest. For example, photographs from a trip through Steinbeck’s California locales for a discussion of Sweet Thursday. Or a sprig of oleander to illustrate the motherhood metaphor in the book White Oleander by Janet Fitch. Some groups incorporate foods and wines mentioned in the selection and serve it at their meetings. Author Susan Vreeland published a little booklet of French recipes to accompany Luncheon of the Boating Party. To add to the fun, members may dress “in costume” for a book. In this case, a Parisienne outfit as might be worn at La Maison Fournaise. Visuals, foods, and authors as guests remain welcome additions to any book club meeting. But, with the explosion of information and ready-made questions, what can the group leader do to make a discussion new, interesting, and energized? Some options are available. These options are all excellent resources. However, one element really keeps a discussion fresh and spontaneous … the leader’s own original questions. Questions that probe, reveal, make comparisons, uncover contrasts, discover connections, and search for layers of meaning. After that, props, food, and technology only serve to enrich the process. The goal remains to uncover ideas through shared insights and lively discussion. It’s still about the people … their thoughts and voices. And a little laughter and fun.